Traveling to the desert. We woke at 7am, packed up our bags, had breakfast at the hotel, and boarded the bus for the long trek to the desert. 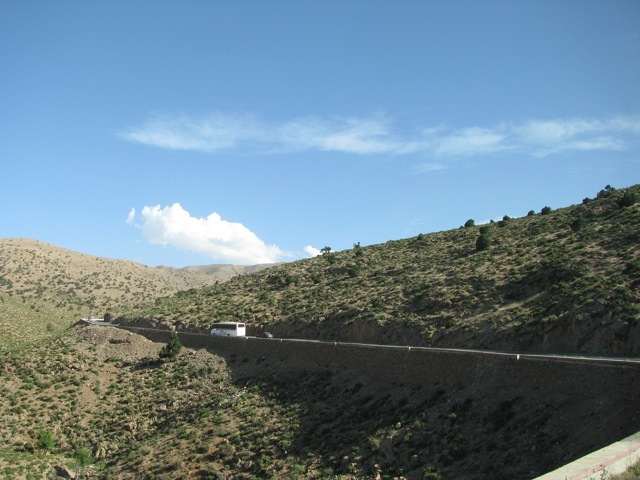 We headed into the middle Atlas Mountains, up through a pass about 6000 feet high. 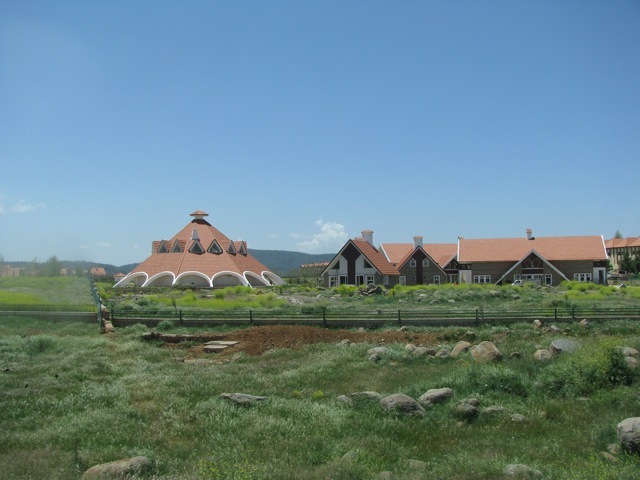 We saw large pastures of sheep, where nomadic people live in very meager homes and tents. As we passed over the mid Atlas Mountains, we passed forests of oaks, miles of red poppies interspersed with yellow mustard and purple flowers. We could see snow on the distant peaks, and we even passed a small lodge marked “skiing center”. I guess it must get cold here in the winder, but today it was very comfortable with a perfect light breeze. 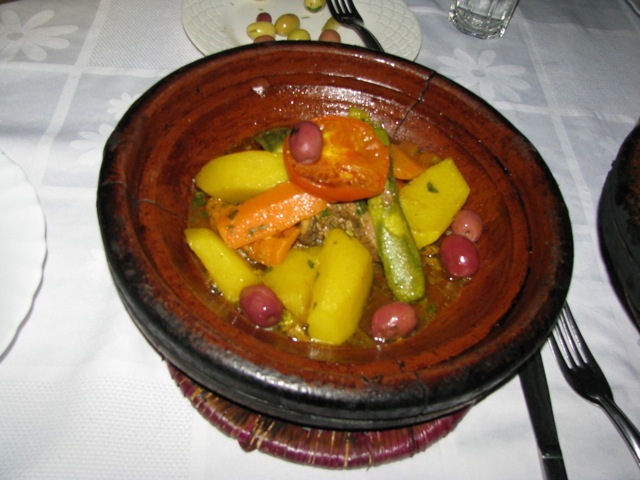 We stopped for lunch in the town of Midelt, at a beautiful Moroccan castle looking hotel, where I ate a beef and vegetable tajine, carrot soup, and some couscous. I stopped at a rock and crystal store across the road from where we had lunch, and did some haggling for a couple of polished quartz massage crystals. 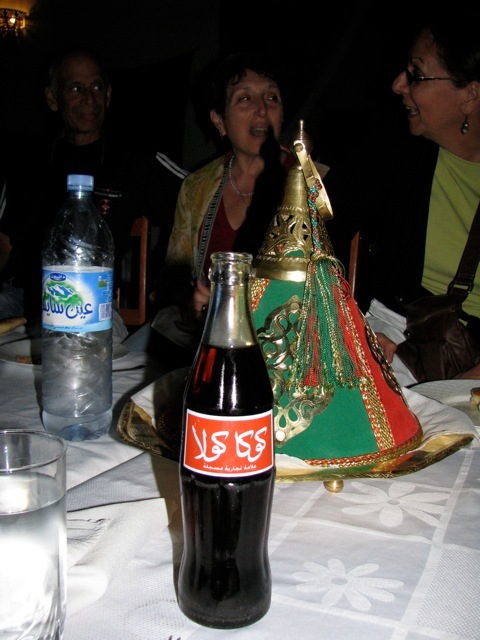 Moroccan coke, with real sugar! The long drive continued, and continued. What we were originally told would be an 8 hour drive turned into 11 long hours. 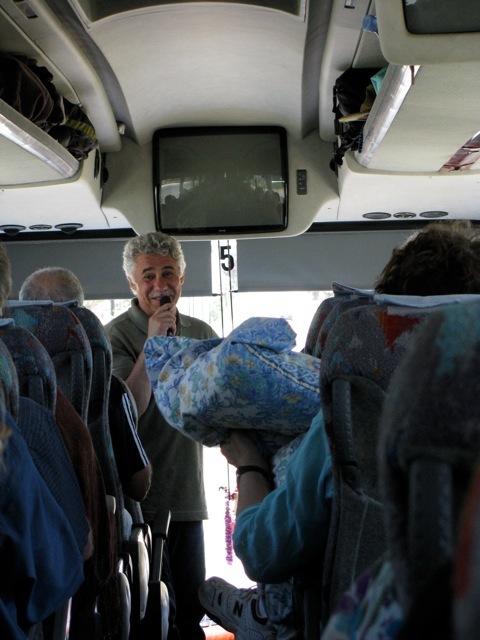 We did have a great time on the bus thought, as Dror and Jaime played some percussion, Hamid and Yuval alternated giving us details about the places we were passing through, details on Moroccan life, politics, philosophy, etc. There was also lots of laughing and some singing as we all got to know each other better. There were actually two buses this time, so we had extra space to spread out, get comfortable, and at some points nap a bit. 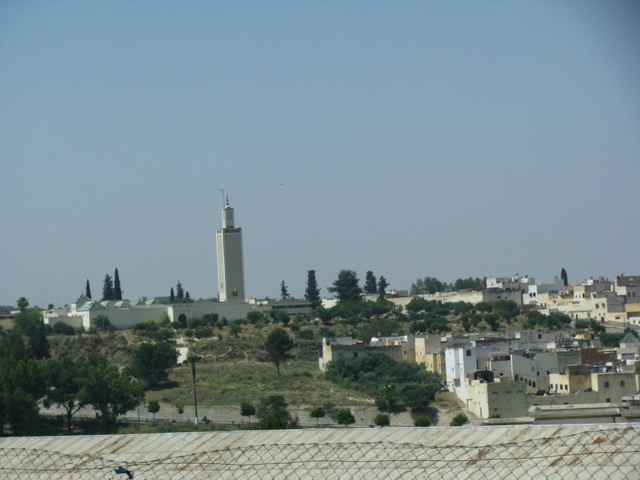 The details on what was going to happen this night were still kept secret from us until near dark, when we approached the town of Erfoud. What we hadn’t been told was that the camp we were going to be staying in for the night was long past where the buses could go. 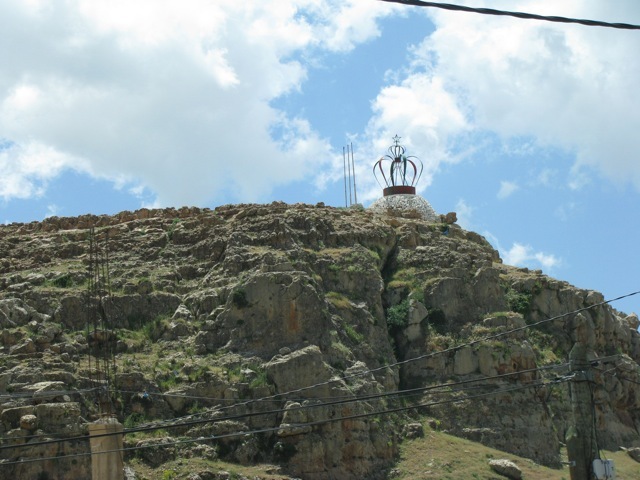 We arrived at the Hotel Belear in Erfoud after dark, and we were given a brief chance to access our luggage (while in the parking lot), and select only the minimum items we would need for the night. We all separated into groups of six, and boarded a fleet of Land Cruisers. We then had a 45 minute off-roading experience that rivaled some rides at Disneyland. Seeing the many Land Cruisers passing through the dirt area leading to the dunes in the dark of night all taking different paths and changing lead over and over, I almost felt we were part of the Amazing Race. It was an extremely bumpy ride, but, for me at least, quite enjoyable. The moon was small, and there were more stars than I had ever seen in the sky. Eventually we came to the end of our off-road journey, and ended up in an area with fifty or more camels all saddled and ready to take us the last part of our journey. 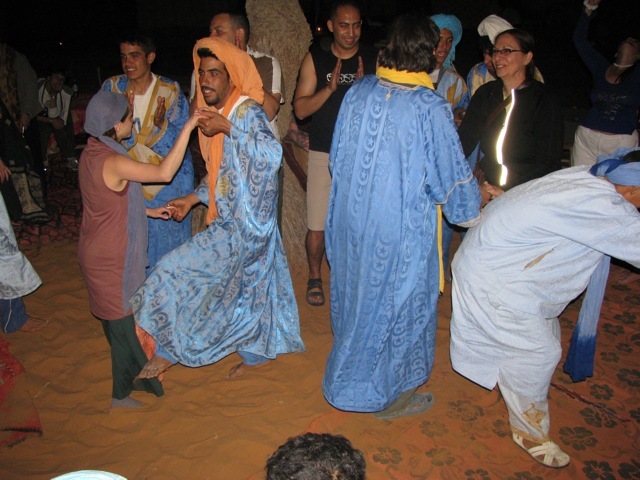 They were tied in groups of four, and each group was led by some Moroccan youths, dressed in blue robes and turbans There was almost no lights, very few flashlights, so we could barely make out where we were, and had no idea where we were going. 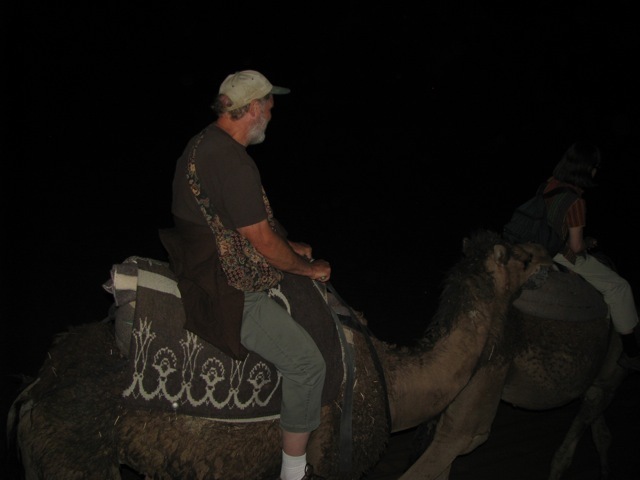 I hopped up on a nearby camel, and eventually all of us were boarded, and ready for our trek. We spent the next hour or so being carried by the camels, led by the young Moroccans through the sands of the desert. We could not see where we were going, and we could not see the ups and downs of the dunes we were traveling over. 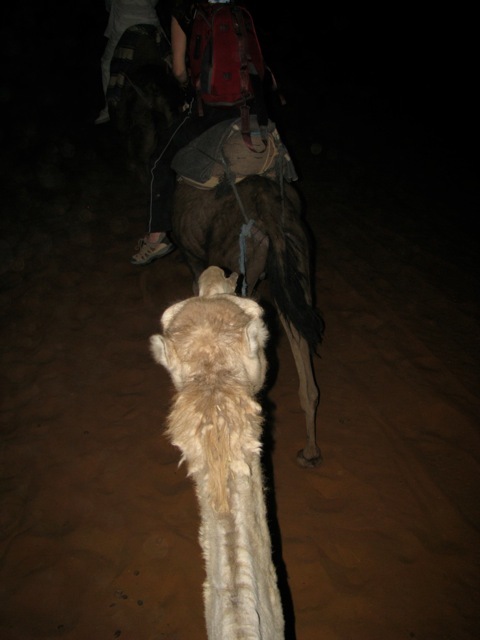 It was at the same time extremely exhilarating, and somewhat terrifying as we bumped up and down on the camel saddles holding on to small metal handle bars. The temperature was perfect, with a warm breeze (though it was past midnight by this time, and we still hadn’t eaten dinner). Did I mention that the stars were amazing (and we saw many shooting stars as well). The walk was somewhat chaotic as the camel caravan seemed to get lost for a bit, but eventually we came to an oasis in the desert, dotted with palm trees, light by candle lanterns. Camel follow-the-leader. Mine is in back. We dismounted or camels and said goodnight to them, hoping that they would still be there for our return journey in the morning. We walked down a candle lit path, still hardly able to see where we were, or our surroundings, and we came to a clearing where dinner tables were set up with candle lanterns on each. 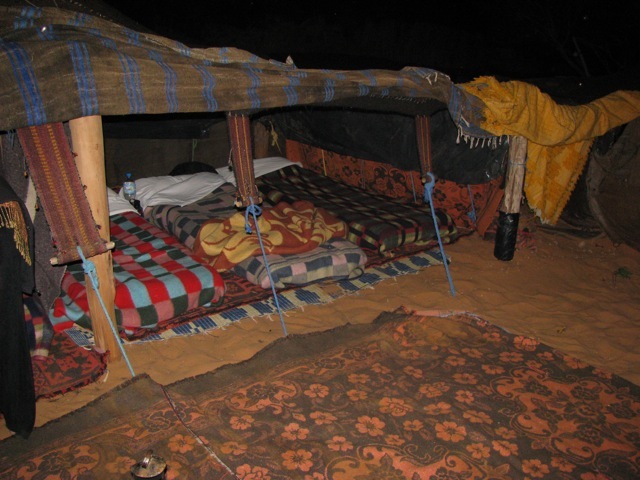 Surrounding the dining area were small, low nomadic style tents in a circle around the camp, each with mattresses, and blankets. 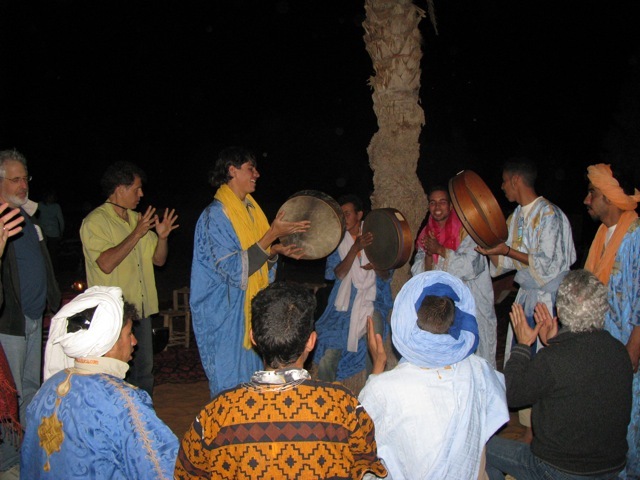 We sat down, and the Moroccan (Berber) youth served us a dinner under the stars. There were sand fleas everywhere, but after such a long journey, we were all starving, and the food was basic, but well received. After dinner, most of the tour members took a chance to claim their sleeping quarters. Some of us waited until much later, which probably wasn’t the best idea. Dinner was followed by drumming, and dancing. Yuval played his Oud, Dror, Jamie, myself, and other tour members all played drums and percussion. It was a lot of fun, but much shorter than I had hoped (I didn’t want to sleep at all, I wanted to jam all night). Eventually we had to stop playing, and the tour members all moved to their selected tents (did I mention that some of us still hadn’t determined where we were going to sleep?). It was so dark, that as those of us without tents moved from tent to tent trying to find a place to sleep. Eventually Dror, Nilli, and myself found a tent with one of the two beds free, and the three of us decided to share it. It was cramped, but we were so tired that it didn’t matter. I didn’t think I slept that night, but actually, I just dreamed that I was unable to sleep. This night was definitely one of the most amazing experiences I’ve had in a long time. And, we still had the sunrise awaiting us in just a few hours, where we’d finally see our surroundings. This entry was posted by andy on Wednesday, May 27th, 2009 at 3:51 pm	and is filed under Preparation. You can follow any responses to this entry through the RSS 2.0 feed. You can leave a response, or trackback from your own site.